We at last arrived in Paris late Wednesday evening, weary from our train-bus-plane ride across the channel and onto the continent. Praying my five years of French classes had not gone to waste, i led us onto (what i hoped was) the train into the city. In a heap, we collapsed on a fold-out seat near the rear of the cabin, both not having eaten since our fry-up some ten hours before. It was far from the movie-star entrance of my dreams, rolling into a luxurious train that sped past all the Parisian sights with convenience and ease. Suddenly from behind us, we heard a tune strike up. I turned, pushing a mass of wool scarf and coat hood out of my face to see a street performer, fingers gracing delicately up and down an accordion. It was like the soundtrack of Amélie had started as the train rolled out from underneath the Charles de Gaulle airport. Paris was working its magic on us already. A decidedly otherwise uneventful train ride later, there was a short cab ride to the hotel and the prowling around Montmartre’s alleyways for somewhere to dine began. We settled on the conveniently close and open Il Pizzaiolo which, admittedly, was Italian food. But we were so hungry we didn’t care, and two glasses into the best Côte du Rhône i have ever had we were feeling very, very French. 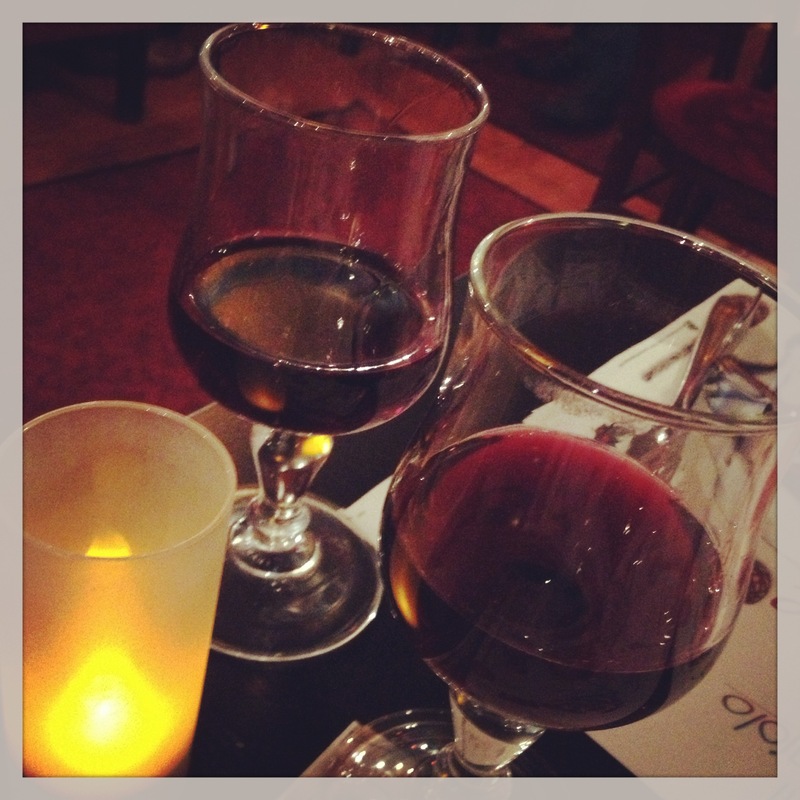 The next morning, though, Paris began to intoxicate us with more than exquisite red wine. Emerging from the Solférino metro stop we were greeted by the most dazzling, sun-dappled Paris day. I was giggling and toe-step-hopping so much that J started referring to my cheeks-sore grin as the “Paris Face.” It was like the world had unwrapped the paper of the most delicious gift, unveiling a present sewn by lover’s-lock-covered bridges and glittering riverside walkways. 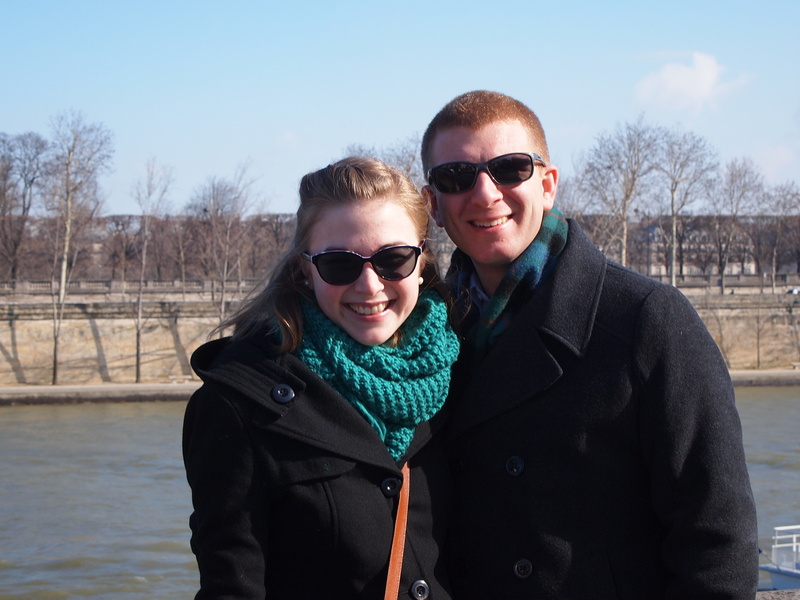 Day one: first photo on the Seine riverbank! 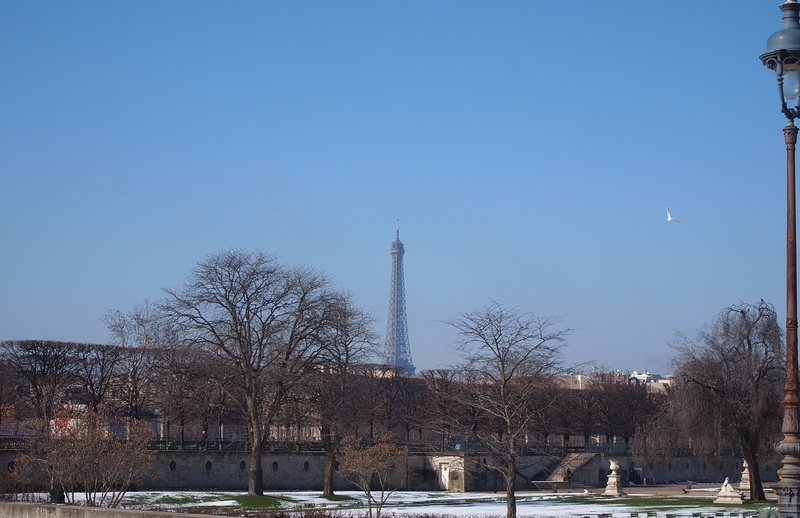 I had thought we would start with the Musée d’Orsay and work our way along the riverbank, but the sun was too seductive to cram ourselves indoors. We meandered our way along the bank, avoiding a few of the gold ring scams but mostly basking in the blue haze hanging over the city. I scampered ahead as we made our way into the jardin of the Louvre, turning back to beckon J along. Instead, i nearly dropped my camera and gave such a gasp he thought i’d been robbed or wounded. I’d caught sight of the Eiffel Tower. Sure, it was barely even the top half, but the navy lines against the pale azure of the sky were entrancing even from across the city. I was half scooped off the ground with what’s-wrongs before i’d pointed to the cause of my exclamation. Giddy laughter erupted from both of us, and soon we were prancing around the glass pyramid and skipping our way back to the riverbank. If Paris was Christmas, we were two little kids riding a French-wine-flavored sugar high. We marveled over street art, eventually acquiring a delectable re-creation of Van Gogh’s sunflowers in acrylic. 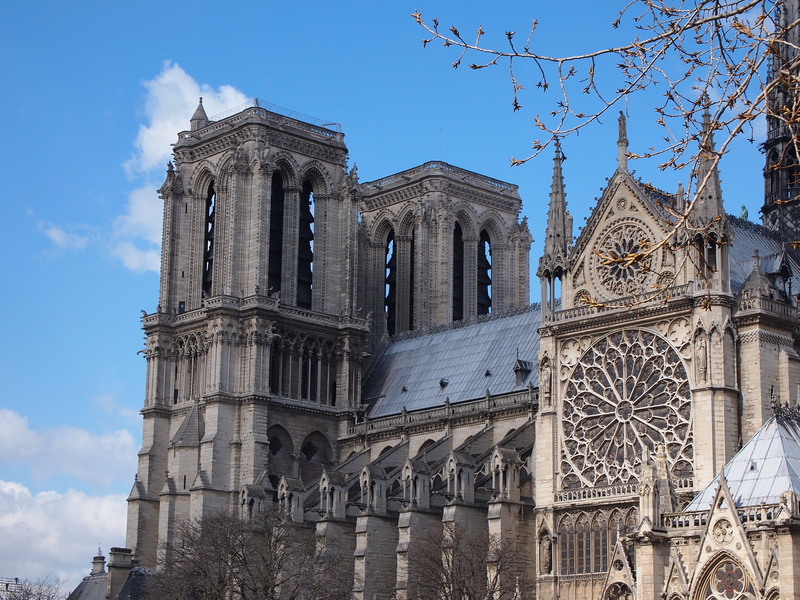 It’s easy to see how the magic of Paris has inspired art for so many generations – Notre-Dame, where we next ventured, is celebrating her 850th anniversary this year. Eight hundred and fifty years. And it took nearly 200 years to build! 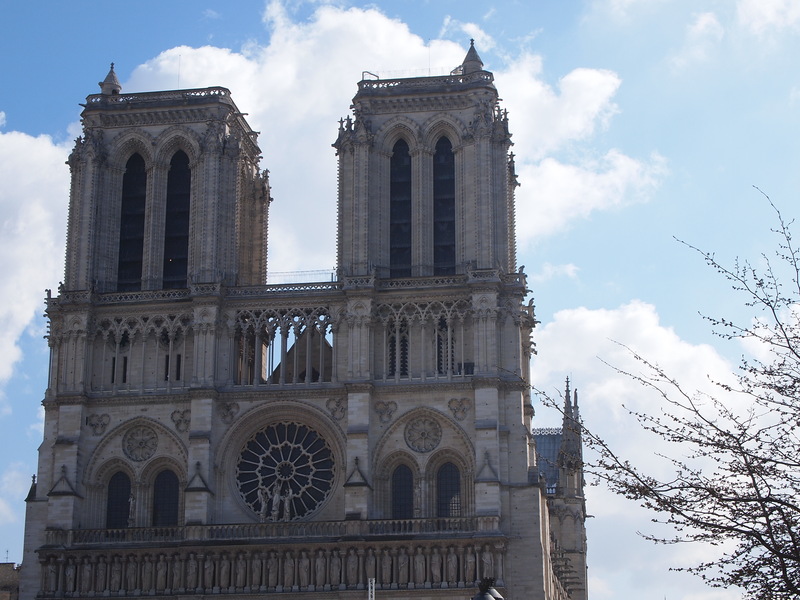 The majesty of Notre Dame was scarcely lost on us; every lux nova-dappled corner of the nave and choir and chapels managed to instill a sense of awe even in the crush of tourists all around us. I can only presume this was a later addition to the Cathedral, since Saint Jeanne lived in the 15th century – some 100 years after the Cathedral’s completion in 1345. Our pilgrimage complete and the pastries we’d eaten for breakfast no longer sustaining us, we made our way down the island in pursuit of a true Parisian lunch. Before we could go any further, though, we came across the newest emblem of the city of love: le Pont de l’Archevêché, or, as it is colloquially known, le pont des amoureux. A bridge intertwining the mainland and the island, now swimming in lover’s locks. I’m not sure how the tradition began, or even how long it has been happening, but for at least the last ten years bridges along Paris have started to amass tiny locks inscribed with the names or initials of lovers. The locks are clasped to the bridge and the keys tossed into the Seine as a (outrageously cheesy and romantic) sign of love. No street musician is required – this bridge (and all the lover’s lock bridges) are part of the magic of Paris in and of themselves. We nestled our lock on a scrap of spare bridge, one among thousands of couples who had once done the same. Next to our lock was one dated to 2004, still others carved with wedding dates and twenty-year anniversaries. 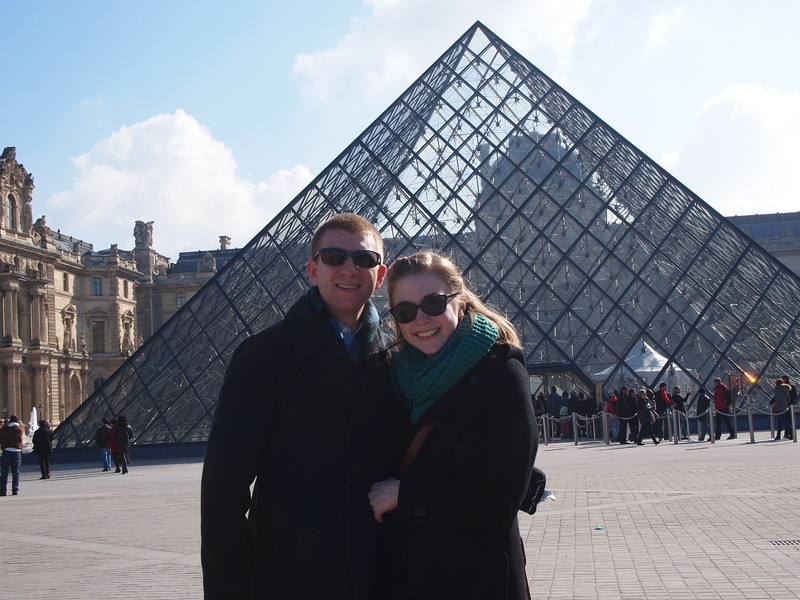 Paris is clearly a place that has charmed people in love for a long, long time. Then there was a-lunching and a-parler-en-français-ing and, naturally, a-wine-drinking at a sweet, pretty little restaurant with a patio looking out at Quasimodo’s famous home. The day was only half-spent, and before us lay scaling the Eiffel Tower and quiet time within Saint Germain. But for now, as this marathon of a blog post has far exceeded my 500-words rule, i’ll take a respite and go back to my Hunchback of Notre-Dame soundtrack on repeat. À bientôt! current jam: ‘wouldn’t it be nice’ the beach boys.